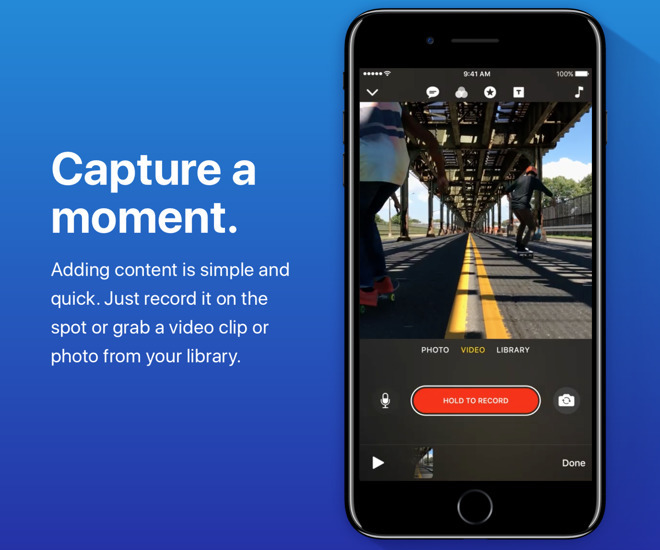 Apple on Thursday released Clips, a new iPhone and iPad app geared toward shooting and editing video for sharing on social media. It's available as a free download from the iOS App Store. 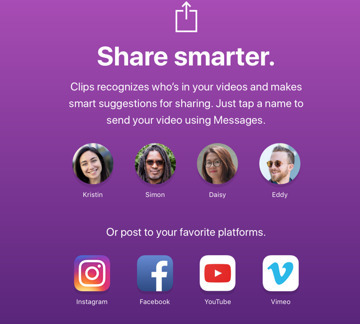 The new Clips app lets users combine short videos on a timeline, with an upper limit of 60 minutes or over 300 individual segments. Users can then enhance their project with things like filters, symbols, and emoji, as well as "Posters," which are fullscreen text-based images used as title cards. 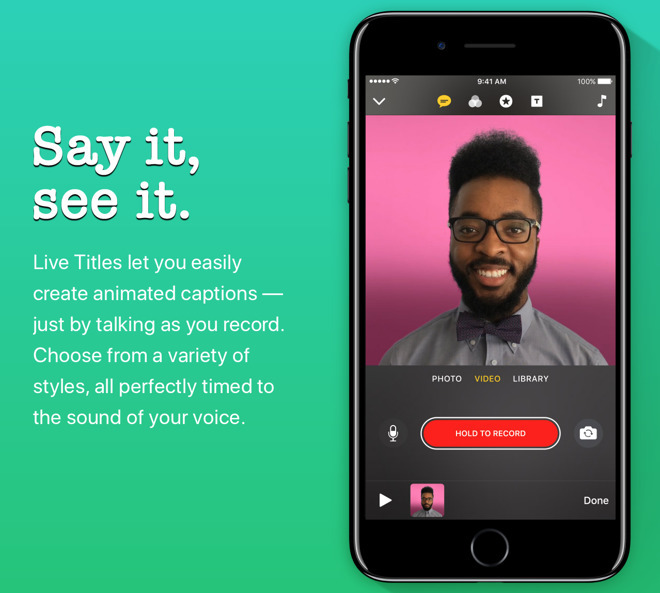 A Live Titles feature translates voices into text in one of 36 languages, and has its own filters, such as shapes, speech bubbles, and animated posters. Translations can be manually corrected. The app can also auto-generate a soundtrack, stitching together introductory, middle, and ending themes. 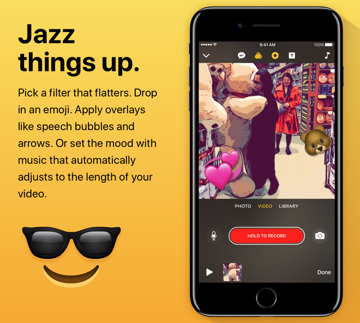 Another feature, Smart Suggestions, uses facial recognition to make matches with people in the iOS Photos app, and hence recommend people to share videos with. 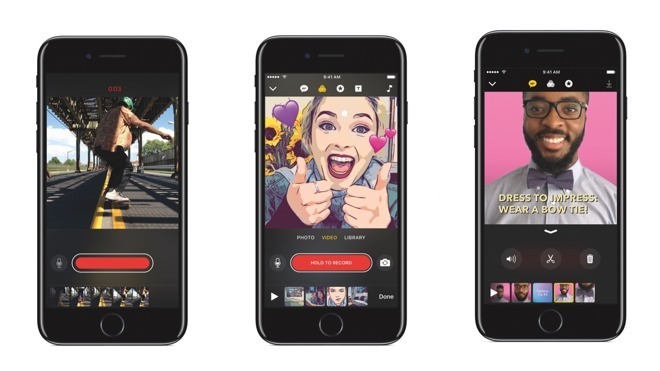 Apple is supporting uploads to a number of online platforms, such as Facebook, Instagram, YouTube, and Vimeo. Clips is a free download from the App Store. It requires iOS 10.3, and at least an iPhone 5s, iPad Air, iPad mini 2, or sixth-generation iPod touch. Apple first announced the app in late March, in tandem with revealing the (Product)Red iPhone 7 and a 9.7-inch budget iPad. iOS 10.3 was released just a few days later, bringing a number of changes but most notably a switch to the more efficient Apple File System.